Is my Sofa long on Leather but short on Sofa? A typical day shopping for leather furniture may often involve driving around town to a number of stores only to hear so many different pieces of information that can be downright confusing. It can be hard to find a decent selection, and much of what you do find may not be high quality. 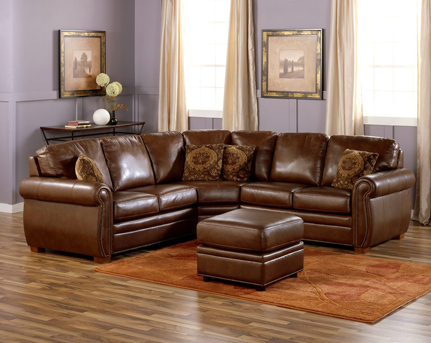 It is best to become educated on leather furniture before shopping to make an informed buying decision. Some things we will cover, before you can make a wise decision on your leather furniture purchase. 5. Which leather is right? There are two main cost components that go into a leather sofa or leather chair. Since leather is a commodity, sold by the square foot and on average a normal size sofa will take anywhere from 4-5 leather hides to cover it, then the raw material cost alone is the biggest factor. Second is the frame and to a lesser extent, the suspension used. It is what you cannot see that counts in leather furniture. 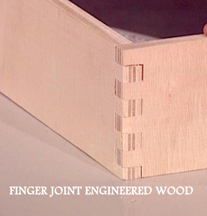 A wood frame that is composed of solid hardwood or hardwood plywood that is kiln dried. This kiln drying removes most of the moisture content wood has, making it stable and not allowing it to warp or split. The corners should be reinforced with wood corner blocks that are glued and screwed into the frame. 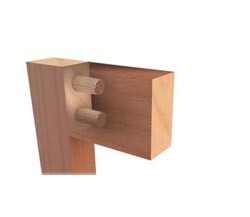 Wood parts should be double dowelled or if plywood is used, a finger joint or mortise and tenon joint to provide durability and strength to the frame. Today with advances of many engineered lumber you might see some of this used in some leather furniture today. 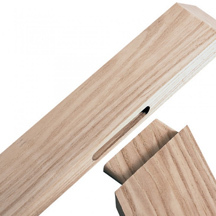 Remember the thicker the wood stock used the better and more durable. In the "old days" when lumber was not as costly as today higher end manufacturers only used solid hardwood frame parts made of birch maple, oak or ash. Many that we carry still do, but today poplar and some other softer woods are used and all of this has a bearing on the final cost of a leather sofa. 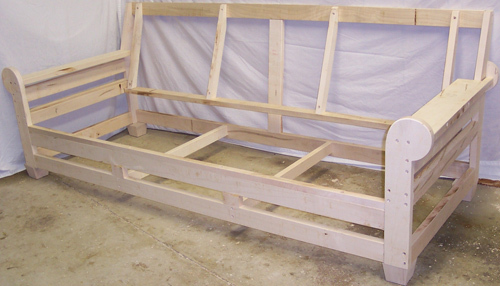 Hardwood frame with solid wood parts. Let's start at the bottom of the sofa, if your sofa is going to last you need to have a good suspension attached inside the frame. This is what supports the weight of the user and with the combination of the seat cushions provide most of the durability you should expect from a sofa. There are only two reasons a sofa has "tight cushions" or (fixed cushions)....Styling or Expense. Some sofas have a "tight seat" or fixed cushion construction which means the cushions are sewn to the frame , in fact the entire cover is slip cover and upholstered over the bare wood. This method was made popular when Italian leather furniture (Natuzzi) first started offering leather in the US in the mid 1980's. This method is less expensive to produce but can allow in some cases a more tailored finished product. Many contemporary styles (European influence) have this type of upholstery. Mom or Dad might prefer a sofa with cushions that do not come off because of a bad experience before with the kids causing them to fall on the floor. or repair if damaged. With a "tight seat" only an upholstery shop can dismantle the sofa enough to get access to the cushions which can be costly. Remember even cheap furniture looks good when it leaves the factory-but not long after you began to use it does it start to make a difference. The real test of quality is how it looks 1 year after delivery, five, or even ten years? The most important thing is the suspension used under the seat Cushions or "deck" of the sofa. There are 4 common methods for 95% of upholstery used today, and here is the pecking order best to least. This consists of an heavy gauge, double cone shaped spring secured, to the bottom of the sofa base usually on polypropylene foundation. A row of steel bands are added horizontally and vertical to reinforce the polypropylene and "L" locked to the frame by nailing or with screws. 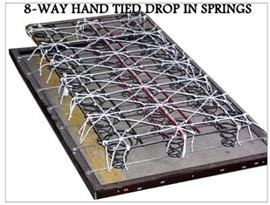 A wax coated polypropylene (will not rot) twine is used to secure the springs in 8 different directions and tied to each other across the entire platform. This type of construction is labor intensive and more costly but when this is finished it has a fantastic benefit of weight distribution unlike other methods and virtually zero stress on the frame rails. 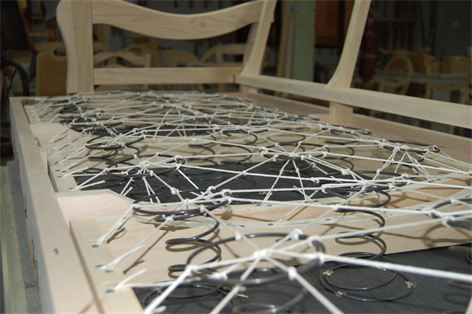 The technique makes the "ride" or comfort outstanding and increasing longevity for the furniture by many years. 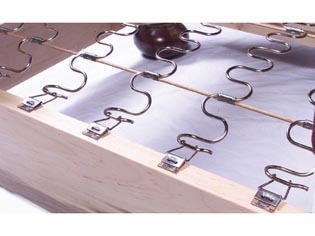 True 8-way hand tied spring over a solid wood frame Steel bands added to the bottom. 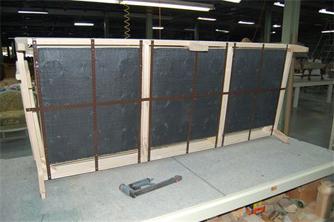 Drop in springs are basically a box spring unit similar to what is used in a mattress. I single cone spring machine built unit is wired together in seat sections (width of a seat cushion). This unit is screwed on top of the frame, so it rides above the bottom of the sofa, whereas a true 8-way hand tied unit is built from the bottom up.Now this method does not have as much comfort or cost as a True 8-way hand tied spring, but still affords a very good support or sit. 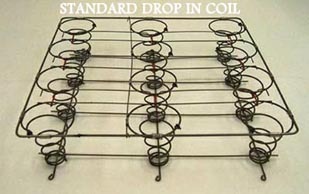 So to makes things interesting and to capitalize on the buzz word (8 way tie) the drop in coil /8 way tied unit was born. 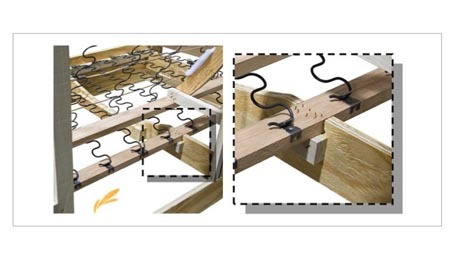 This is more marketing than anything else, what is done is twine is added to a spring system (that does not need it) to allow the use of the word 8-way hand tied. Now do not get me wrong, I am not ranking on it, I just do not find it necessary. This type of spring up, is probably the most common system used in the furniture industry from fabric to leather manufacturers. A metal wire that zigzags (see diagram) is connected vertically from the front rail to the back rail with metal clips stapled to the top of the frame rail. This method is less costly to build then the previous system. Now there is a big difference in this type of suspension and how it is used to indicate quality. 1. What gauge or (thickness) or wire is used? The thicker the more supportive. 2. How much space is between the springs on the frame? If the springs are placed far apart then it is cheaper to build (cutting corners) with less support and a bucketing effect will eventually occur from the suspension failing over a short period of time. 3. Are stabilizing edge wires used, around the perimeter these help control the ride and allow the springs not to roll? D .Webbing, Rubber webbing (Pirelli®) brand of webbing. This method is the easiest and cheapest way to add suspension to a frame. All you need is a staple gun. Nylon/rubber webbing is interwoven vertically and horizontally from rail to rail and stapled to the frame. This system reminds me of an old lawn chair and wears about the same. Nylon webbing sags over time and does not have memory like a spring does. If the user is heavy avoid this method of suspension. This system was made popular when Italian furniture made its way into the US in the mid 1980's with Natuzzi. At that time I was selling leather furniture as a manufacturer representative for a leading US company, and I remember you could buy an "Italian leather sofa" for $999.00. In the 1980's Natuzzi was made in Italy, during that time the government subsidized the brand and they could sell and ship a sofa here and retail it for under $1000.00, although it was built on particle board and pine, very soft low density foam, and stapled frames. This was unheard of at that time, because sofas in leather were mainly produced by higher end brands made in North Carolina at a retail cost of $2000.00-$3000.00. So the industry exploded for leather because of this attainable price point where before only the more elite could afford it. So imports flooded the market from Italy, and the rest of Europe.US manufacturers took notice and started building its furniture in other ways to compete with this new found competitor. Hence the different spring systems and frame options used. Today, to remain competitive, these same Italian brands have had to source offshore in China and because there is not a bottom in furniture price, its how low you can go.Funny these Italian sounding companies have their furniture made in China. So with that, Chinese imports made way for even more affordability and the big Box stores jumped all over that product so they can have leather furniture and retail it at surprising prices. It is buyer beware, when shopping today, that is why it pays to learn a little bit about what you are buying. Now the other big contributor to a sofa lasting a long time is the seat cushions and to a lesser extent the back pillows. If you have a choice, buy a sofa with loose cushions because of benefits we covered earlier. If this is not an option on a sofa you like, then be sure and get a HR foam cushion, which stands for "High Resilience" so you can assure yourself of wear ability. Here are the types of seat cushions available.Aim for 2.0 to 2.2 lb foam. The DENSITY rating of furniture foam is expressed as a two digit number which may range from 18-35. Actually, there is a decimal between the two numbers which makes the density rating of the #18 foam 1.8 foam. In the production of foam, there are two basic ingredients which are the urethane chemical that is the foam, and air. The more chemical that exists in the foam material, the higher its density rating will be. In the above example, the 1.8 rating means that there is 1.8 pounds of chemical in each cubic foot of foam material. A cubic foot is equal to an area that is 12" x 12" x 12". This particular foam would be rather low in density and would not be a good material to use in seat cushions alone. Some manufactures use standard poly foam cushions (not HR foam) which are not recommended for durability. HR foam is a basic cushion and has a Dacron wrap for comfort and inserted into the seat cushions. It is better if the cushions are bagged/sewn in a muslin ticking for added durability, but it does add to the cost. HR foam cushions with a down feather wrap sewn into a muslin ticking. These cushions provide a more casual appearance a "puddled look" so to speak, but do provide a more comfortable sit. HR foam cushions with innerspring coils and Dacron wrapped. These cushions are the most durable over time because the coils provide longer support and wear that foam alone cannot give. The coils are fully open inside cotton socks encased around foam and Dacron wrapped for comfort. These cushions can have an additional step of down feather added around the cushions to create a more comfortable ride. Back cushions are important too but do not carry the weight load of a seat cushion. Most manufacturers use Dacron, polyester fiber, down feather, in some instances if a tight back is used foam. An added plus is if you can get a cushions loose where the cushion is zippered for access so you can add fill or fiber down the road when it softens from use, a big plus. Now better manufactures will channel the fill which means they sew it horizontally in several places so it does not settle down into the bottom of the cushions. Not all beef animals produce hides suitable for leather upholstery: this is determined by the types of animal and its place of origin. Tanners buy hides in bulk, sight unseen, with all qualities included. When hides are culled and graded, only three to five percent of the hides can be used without having to alter, or "correct" the surface before coloring. These are considered the premium leathers. The remaining hides have their surfaces corrected by either sanding, embossing, pigment coloring, or a combination of all of these. The more correction required, the less expensive, supple, and natural the leather will be. Additional reading on leather facts . Manufacturer's of leather furniture purchase their hides from literally all over the world. Keep in mind, cow leather is a byproduct of the beef industry, bovines are slaughtered for the beef and most of the worlds hide supply comes from the Americas, North and South America as we are the largest consumer of beef in the world. So think about it, US cow hides tanned in other countries. This is mainly due to Epa regulations stopping most of the tannery operations inside the US. There are some finishing tanneries still around that actual receive the leather article tanned already and color or dye it here in the US. Some of the best leather tanned comes from countries like Italy, Germany, and Swiss countries as they have some of the oldest tanneries in the world and have perfected it into an art form. South America is another country where hides are produced but at a more favorable cost than European hides. A side note, many people assume that better furniture is made in Italy, but this is generally not true as the brands found in this country are more promotional built furniture "see my manufacturer ranking chart" . Most of the cattle hides from European countries and pen cattle, better taken care of, kept from harsh weather conditions and grown larger before heading off to the grocery. This creates more desirable byproduct and more yield in the hide. Leathers derived from Americas come from grass eating, outdoor range animals that have been subject to barb wire, branding, winter snow and summer sun. The place of origin of hides can be divided into three groups. This classification system is used by the tannery to classify leather hides not used by the manufacturers themselves. A. A. Hides from Southern Germany, Hides from Swiss pastures, Scandinavian Bull hides from Norway and Finland. Hides from Northern Italy. B. Hides from Northern Germany, English hides, Dutch hides, and North American US hides. C. Australian Hides, African hides, South American hides, Hides from Asia. Another thing to consider before you make your purchase is where the furniture will be used and your lifestyle- if it is to be in a family room where you gather to watch the Tv or entertain regularly, eat, and drink then you do not want the finest grade of leathers. Do I buy Top Grain, Full top grain, "or some other leather"? 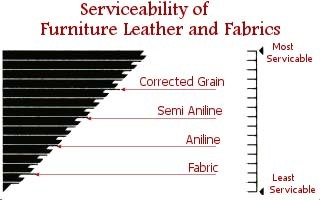 Pure aniline leathers are not as "serviceable" as lower priced leathers due to the naked hide where just a staining process is done to color the hide. The most confusing term used in the furniture industry is the term " top grain'. It can be a contradiction because it often implies what it is not. "Top grain", is the definition that is generally used when the grain is not genuine: when the real grain is sanded away and an imitation grain is stamped into the leather. When the genuine grain remains, the leather is called, "full grain", or " full top grain, "not simply top grain". The term "top grain" refers to the outer part of the cow hide where the hair was before it was tanned. It does not mean "top of the line". Hides selected for furniture are sliced to a uniform thickness on precision machines where the raw material is pulled into a machine and long cylindrical blades cut the leather thickness wise similar to veneering a log. There can be two to three cuts below the top grain because a full hide is approximately 4mm thick. The cuts below are split leather. Just as the grain, texture and markings of wood should reveal the nature of the tree from which it came, leather should display the natural markings and grain characteristics of the animal from which it was taken. The best upholstery leathers are clear, clean, and supple. They are also dyed through with transparent aniline dyes. The full natural grain is retained and they are called "full grain leather". The better the quality of hide or skin, the less it has to be treated. The natural grain variations should be exposed. One should see the "fat wrinkles" and the feel, or hand, should be supple and natural to the touch. So when choosing your leather, make sure it looks natural, smells good, and has a soft hand. Inspect your leather carefully. Make certain that it retains the full natural grain. Full grain leather - it is the tops! These are the best quality leathers because no "correction" to the hide is necessary and the original grain is left intact once the hair is removed. This type of leather is the most expensive available and most desirable by leather aficionados. These leathers are used for pure aniline or full aniline finishes where the grain shows, neck wrinkles, fat folds and other light scarring of the hide reveals itself due to the staining process. Here is an odd fact, the more that is done to a leather hide as far as processing the less the cost. Think of it this way, logic would dictate if more is done, then why does it not cost more? This is because, the more pristine the hide is in quality it will command a higher cost at market. Leather is a commodity and ( fewer of these types of hides in the world less than 5%) makes the actual raw material more expensive and this is before any finishing or processing is done. Splits are the second or third cut from below the top grain.The lower portions are weaker, due to the elongated cell structure. Splits are subject to stretching and therefore provide an unstable base which results in cracking of topcoat finishes. The familiar "chamois" used in auto care is an example of split leather.Split leather is used for belts, shoes, handbags etc. By cast is split leather finished on top with a polyurethane top coat and is usually shiny. This came right before the advent of Bonded leather. These product alternatives came about due to the explosion of the hide market. When the economy started to revive after the last recession the auto industry took off , leather used in automobiles (and clothing) take more of the world hide supply where as furniture uses about 2% of hides available. Raw material kept going up so the low end or more promotional manufacturers (remember when we talked about there is not a bottom to prices or quality) needed something to keep their price points ,so then came Bonded Leather. 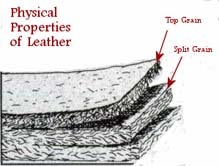 Bonded leather is not real leather , it is a man made material consisting of 10-25 % ground up or reconstituted leather and used as a backing and a layer of PU or polyurethane which is basically plastic and fiber is added to the top and embossed with a grain to mimic real leather.This article will peel and delaminate within a few years if used regularly. The problem is, it does not wear well. So if you do not want to replace your furniture in a few years, do not buy this product. With that said, if it is used in a non touch area like where vinyl would be used in a "leather match area" then it is a better material then normal vinyl and can be a plus. Just remember man made usually is never as good as the real thing! 5. Which leather is right for my home? This stands for "Finished" or "Protected" aka Pigmented or painted. All meaning the same thing essentially- the leather is usually dyed in a base color ( except for some colors that might be close to the hide color) then an additional process of color is added on the surface of the hide by spraying and topped off with a clear coat for protection. This process hides or camouflages many of the natural markings in a hide. These leathers have a firmer hand or feel but require the least maintenance of all types of leather. These leathers will also have a corrected grain (embossing) done because of the hide quality. These leathers will have the most colors available due to the painting of the finish. These fall into the top 20% of hide supply. These leathers are for high traffic applications. The most stain and sun resistance. Think of Pigmented leathers as plywood, you would paint it to cover defects like knots, not stain it. This stands for Aniline plus or Semi aniline-AP leathers are dyed with aniline dyes which color or stain the hide then a very light micro-pigment color is applied to give the leather some even color or offer a wider range of color options then a pure aniline leather. A slight top coat is added to give the leather more serviceability. 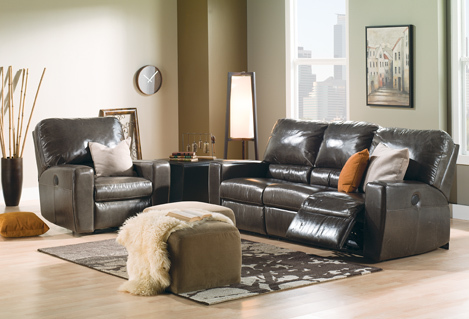 These leathers are softer and more desirable than "F" or "P" leathers and are still good with a family room situation. These leathers fall into a medium price range and offer an excellent choice for those who oppose variations found in true aniline leathers. Only a limited number of hides fall into this category, if corrected grain hides are used their selection is less critical and the hand will not be as soft. These fall into the top 10% of the hide supply. These leathers are for moderate traffic applications and have a moderate stain and sun resistance finish. Only premium hides of fully grown animals are used for this application, and only 3-5% of the world raw hide supply are free enough of defects to be suitable, in aniline dying, an extended tumbling process enhances the natural grain and gives an extra softness.These hides are drum dyed in large vats or drums and the color is forced into the hide for many hours permeating throughout. A soil resistant surface can be applied similar to what is used in fabrics to repel spills and stains. Leather that has only been dyed with aniline dyes is referred to as a "pure aniline" or "naked aniline". Some aniline leathers can go through an additional process where a very light roller coat is added for serviceability (cleanability) hence the name Full aniline. Nubuck is usually the reverse of the top grain or underside of the hide or it can be the top grain sanded or buffed down to reveal a "nap" or suede like feel. These leathers are the softest but also the least desirable when used in a family room. One main point is the accumulation or build up of body oils over time causing the leather to turn dark and spills tend to soak in, even if the leather is treated originally because scotch guarding wears off making it almost difficult if not impossible to remove stains without damaging the finish. Avoid this leather if you need an article to not fade, absorb spills, fade easily, etc. These leathers are for light use, lower clean ability, can fade with sunlight. Let's talk grading of leather, this is where it gets more convoluted. First there is not a standard grading system used for leather furniture by manufacturers. When a factory assigns a grade to their leather this is dictated by what they pay for the raw material. The cheaper the leather hide, (or price point) the lower the grade, and the finer the hide, the higher the grade.Some brands use the scale 1, 2, 3, and so on, or 100, 200, 300, or 1000, 2000, or 3000, or maybe A, B, or C. Whatever they use, it has no relation to another company that makes leather furniture, so do not try to compare this way, it is a waste of time and you will be disappointed. Hopefully you have learned enough to make you a leather "Jedi", if not, maybe enough knowledge to guide you into making a good buying decision. Now, when you start your shopping for that new leather recliner, chair or sofa set, keep in mind, the Big Box furniture stores in your area are kind of like Home Depot or Lowe's is to Ace hardware or your family run hardware store. Here you might have a huge selection of "stuff" but when it comes to finding an expert to answer questions....good luck. This poses a problem for the prospective customer, as misinformation is given and you cannot assess quality if you cannot get the right answers. The large multinational chains operate on the "KISS" program (keep it simple stupid) and offer the basic Chinese imports or low end Mississippi made domestic brands. These companies usually have no special order options or the furniture is premade in one color because it is imported. To find the most selection, better quality options, and knowledge visit a leather specialty store or if online find a reputable one with A+ rating with the BBB to assure you can get the best service and care. Leather specialty stores will offer many brands to choose from and give you options for your budget. Since all they do is leather, you will see more, get more, and be happier with your purchase then a store who offers it as a sideline where you have to settle for off the shelf choices. Bigger furniture stores might be the ones you hear most often due to advertising and media spending, but search out a specialist when you want leather furniture, you will not be disappointed. There is not an absolute bottom or top to leather furniture pricing and or quality of construction. Each representative manufacturer decides what area of the market they want to sell their product and how they want to build it. This is why some of the brands you might of heard of like Ashley, Bassett, Lane , Natuzzi or maybe La-Z-Boy garner more name recognition because of advertising and promotion and due to the lower price points they have appeal to a wider range of the purchasing population. Bradington-Young, American Heritage or Hancock and Moore might not be as well known to the public but do offer a much better built piece of leather furniture. Bernhardt and Thomasville are well known brands of wood (case goods) furniture and decided to offer leather furniture because of the popularity in their merchandise mix. But this does not make them a specialist like a Classic leather or Bradington Young who are some of the oldest companies in the US for leather only manufacturing. When you purchase leather furniture it is best to buy from a company that specializes in leather this way you can be assured of a piece of furniture that is engineered to last and paired with a quality leather covering it. If you have a choice, buy North American or US domestic made leather furniture, it supports the local economy and workers plus you will generally get a much better piece of furniture then an import in a similar price range. Written by Jim Winkler, founder and owner of LeatherShoppes.This is copyrighted material and cannot be reproduced without written consent. Mr. Winkler is an industry veteran, learned the business from a leading Leather Furniture company in North Carolina in 1980 working on the assembly line. Upon returning, began as a manufacturer representative for the same company for 10 years and then ventured into retail, founding and opening only the second leather only specialty store in Houston in 1988 and operates it today. 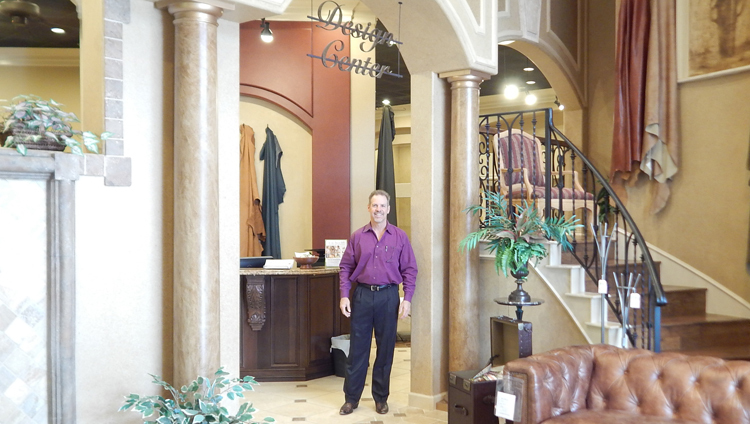 Mr. Winkler has over 34 years in the leather industry and has been quoted in many publications like Furniture Today the leading furniture industry paper, and House and Home magazine, "Ask a Pro" and other media. 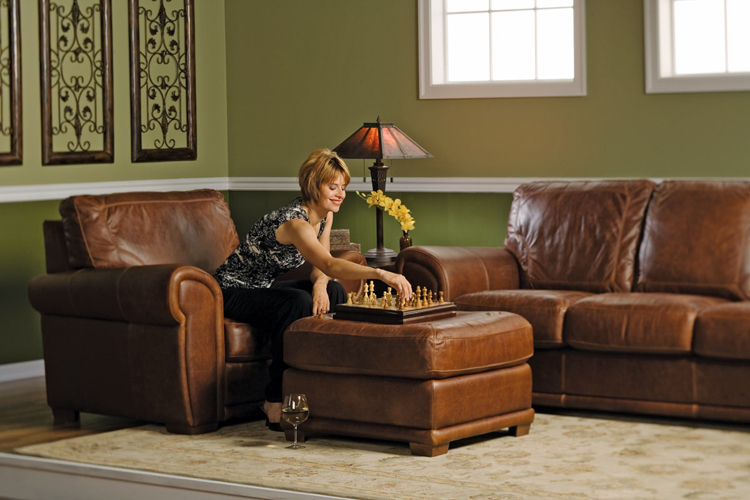 Be sure and read his "Manufacturer Rankings" to find out who makes the best leather furniture .